I have been craving a cheeseburger like crazy lately. I have a lot of fun twists on cheeseburger flavors on my blog already: Cheeseburger Pizza, Cheeseburger “Cupcakes”, Cheeseburger Lettuce Wraps, etc. As usual though, I wanted to try something new. I recently remembered my love for Flatouts (I used to buy these all the time and I have no idea how I forgot about them or why I stopped), so a cheeseburger wrap seemed like the perfect dinner solution. I use the ingredients below together in a lot of recipes, so I started brainstorming (well, if you can consider immediately pouncing on the first idea that popped into my head brainstorming…) how to improve upon juicy seasoned ground beef smothered in cheese, ketchup and mustard, topped with crisp lettuce and ripe tomatoes. Then I realized…bacon. Is there anything that can’t be improved with bacon? I love the Hormel Real Bacon Bits because they’re an easy way to add just the right amount of bacon to your dish without any extra work or clean up. These wraps are satisfying, packed full of flavor and they come together quickly. Consider my burger craving squelched. Bring a large skillet to medium heat. Add the ground beef and hamburger seasoning and cook until meat is browned. Drain meat. Clean skillet and set aside. Place meat in a medium bowl and add the cheese wedges, ketchup, mustard, cheddar and bacon bits. Stir to combine. Microwave on high for one minute. Stir again until meat is evenly coated. Spoon a quarter of the meat mixture (around a generous ½ cup) onto the center of each flatout and spread the mixture lengthwise, leaving about an inch at each end. Evenly distribute the shredded lettuce and tomato pieces across the top of the meat. Fold in the 1” ends of the flatout over the filling and then fold in the long ends to cover it. Lightly mist the large skillet with cooking spray and bring over medium-low heat. Place the wraps fold-side down onto the skillet (I did them in batches of two) and let them cook for 3-4 minutes or until golden. Flip the wraps and continue to cook until golden on the bottom. Cut in half and serve. Just put these on the menu for this week! Made this last nighte. Yum!!!! Where do you buy those flatouts. Live in Canada but shop in Buffalo. Thank. Wegmans and Tops both have them! Hi was wondering what you could substitute for the laughing cow cheese? I cant seen to find those two flavors anywhere. I’ve used the Santa Fe cream cheese tub before and just did 4 T turned out good might be a little more calories though. Mmmm, this looks SO GOOD! Changed it just a bit with salsa instead of mustard and ketchup and had a chimmi! I made these for dinner last night and my husband LOVED them, well so did I! Yay! Glad to hear they were a hit! I can’t to make these thins weekend. Looks so Delicious! These are delicious & very filling! We had a hard time getting them to fold up nicely, but my husband finally got the job done! Thanks for sharing Emily!! So good! OMG! These were amazing! We both loved them. Hooray, glad to hear it! Oh my -These are delicious!!! I made stretched the meat out to 5 servings to match the number of flatouts in the package and the points went down to 6. I’m going to try them with LC creamy swiss cheese and put mushrooms in with the meat for a “Mushroom Swiss Bacon Cheeseburger”. Thanks Emily for so many good recipes – you make my WW journey easier and tastier! Yum, great idea! I love mushrooms. Happy you loved them! This sounds delicious!! I LOVE burgers but not the “why did I eat that” feeling afterwards. Going to try this recipe tomorrow. Paired with the microwaved potato chips, it will be one yummy dinner! Thanks! I made these tonight and they were very good..but just a note on wrapping them. The first time I tried, the flatouts pretty much crumbled/broke into a bunch of pieces when I tried wrapping them. So I tried again after putting them in the microwave for about 10 seconds to soften them. Then, I had to put the meat in a long tubular shape inside the wrap. If you spread it out flat you will never be able to wrap them. Then, gently fold up the ends (not too hard or it will break). Next, ROLL the wrap. Do not FOLD it, or it will break in half. Otherwise, very good! Hm, I have never had crumbly flatouts before…I’m wondering if your package was expired or problematic. My flatouts are always super pliable. I’m glad you liked them anyway. Thanks for providing tips in case anyone else has that issue! I agree on the one person that said used Salsa…I was not a big fan of the mustard but my boyfriend loved it…Otherwise was really good..
Glad you both liked it! Can i skip the skillet and combine all the ingredient and just throw it on the grill? these sound delicious–will definitely try them…I have a question Emily..how hard is to change a regular casserole recipe to a “cupcake” recipe–you’ve got me addicted to them..lol..
Haha, it’s actually pretty easy. Wonton cupcakes are very versatile – you can layer pretty much anything in there! Just tried these and they were awesome! We tried these last night (our first recipe from the site! :D) and LOVED them! We have a thing for burgers in our house but we wanted to switch it up and the flatbread seemed like a great change. We used two slices of chopped, real bacon and cooked it with the meat to give it some extra flavor. I also loved the usage of laughing cow (my favorite) but we did it with the garlic and herb since that was all we had on hand. Gotta love how cheesy these things are! 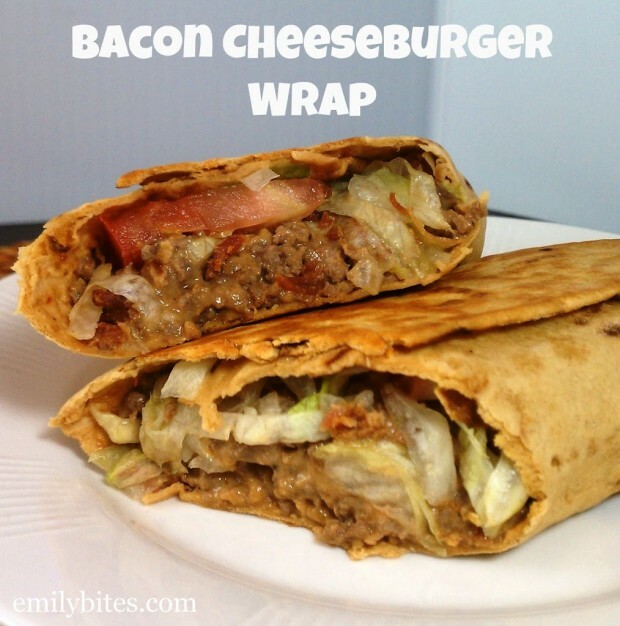 We will definitely be making these again (and I think I need to add some grilled onions next time, too…YUM!) THANK YOU! I can’t wait to try some of your other recipes. And to the posters having issues finding the flat outs (which are awesome, by the way) I had to go to walmart to find them because the local grocery store didn’t have them (despite the flat-out website saying they did.) Since walmart is such a large scale company they tend to carry a little more in the way of products, so you might want to check there. I made these yesterday for my family. SO delicious! I added onions & mushrooms to the hamburger mix and topped it with jalapenos (for my husband and I) and pickles for the kids. They were easy and tasty and are in our dinner rotation now. Thanks so much for all the great ideas! Sounds tasty – glad your whole family enjoyed these! Absolutely amazing! My husband was even impressed! These are super creamy and filling! Glad to hear these were husband-friendly! I made this as my first emily bites recipe last night and was super impressed. I changed mine up a bit and it turned out delicious. I didn’t fold the flat out because it seemed to difficult, and also formed the burgers into patties, and just made it like an open face sandwich in the flatout, but it was super good. I want to try grilled onions and other variations. Glad you liked these! Sounds yummy. Let me know what you try next! These were delicious! My husband and son loved them too. I made them last week for dinner and they are on the menu this week too! SO good! My favorite yet!!! I changed mine a tiny bit but nothing that would change the recipe really. Had no trouble with the wrap and it was maybe one of my favorite things I have ever made. Thank you! This recipe was fantastic! Thanks for sharing!!! I’ve never commented on a recipe I’ve attempted, but there’s a first time for everything right? I admit that I’m not much of a cook. 🙂 I made these last night…FABULOUS and EASY! I substituted in ground turkey and turkey bacon. These will now be in the weekly rotation! I bought my Flatouts from Harris Teeter. Thanks for sharing! We had these tonight, and they were excellent! I rate these as my second favorite Emily Bites recipe (the first being meatloaf muffins). Thank you! I just started ww yesterday and I love your website! These were sooo good and filling! Thank you for your recipes they have gotten me off to an amazing start! I made these tonight, and they were amazing! My 4 year old son told me he loves the new recipe! Thank you for sharing! REALLY good recipe and filling! I would love to eat with some sweet potato fries when I have some extra points! Thanks for the low calorie recipes. Making these tonight. My store does not carry the Flatout bread anymore so I have to sub for a 90 cal wheat tortilla. How would these be with ground turkey? Anyone try it, that is what I have in the house! Also, I would make a batch of 5, but its just the hubby and I, so would probably save the extras for a quick week night meal and just heat them up!- Krista R.
I made these tonight as well, and DH loved them too. Ours also made 5 as I used low carb wraps instead of flatouts (the wraps was all I had) do you think I can freeze the extras?? I just made these tonight and they were delicious. Used the original Laughing Cow as that’s what I had in the frig. Found the flatouts at Kroger. My husband said it tasted like a wrap from a restaurant. This was so easy and quick to make – will make again for sure. I just made these for dinner and wow! I used ground chicken (what I had on hand) and they were delicious! Definitely going to be on the menu again! I was pretty pleased to discover this site. I need to to thank you for your time just for this wonderful read! I just made these and you are a magic woman! Soo so so so good! Thank you so much for sharing! The flavor in these were amazing!!!!!!!!!!!! I’ve made them twice now and had to fight to even get one of them. I had the ingredients in the fridge wanting to make them when I got home from work tonight but came home to find that my son made them for himself and left me with no ingredients! I knew for sure then they were a keeper because he hates cooking for himself. Making these tomorrow night for supper. They look gloriously messy and I can’t wait!!!!! These were great! I wasn’t sure about the mustard, but the addition of it really made it tastes more like a burger than it would have without it. I also used the light swiss laughing cow becasue the store didn’t have the queso. So delish. Thanks for all of your great recipes. BTW, my boyfriend recently said to me “you have to give me this new website that you love so much.” I guess that means he approves of everything I have made him. This was absolutely amazing! Loved that it all stayed together and didn’t fall all apart as my family was inhaling it! These were awesome! 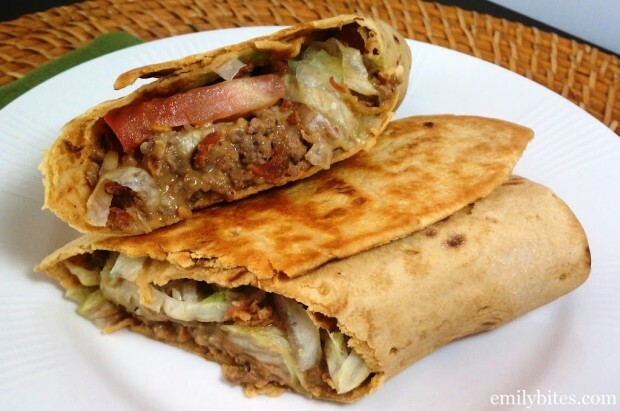 I used a low fat pita pocket instead of the wrap and my husband and I loved them. Thank you so much for these great recipes! This one was so freaking delish and after I had only eaten half of it I was SOOO SUPER STOKED to know there was an entire half waiting for me! It was filling, it was satisfying, and it was soooo yummy! My boyfriends has loved every recipe so far (his favorite is the Cheesy Taco Pasta). This may sound pathetic, but we eat Tuna sandwiches once a week (super cheap/easy) but you are on my menu EVERY OTHER NIGHT OF THE WEEK this week! You are awesome and thanks again! I made these tonight for dinner, and boy did they hit the spot. It’s difficult cooking for 1 so the next time I make these I will either 1/2 the recipe, or make the meat mixture and make each one fresh when I eat it as leftovers. These are great, just don’t know how the made ones will hold up in the fridge because of the lettuce and tomato. Thanks for this great recipe! I’ll be making these a lot more and phasing out my boring turkey burger recipe! I found this recipe and sent my boyfriend a list of a few things to pick up from the store, as I had class that night. Class went late, so I asked him to cook the meat so I could finish the recipe. Came home and was surprised that he actually made the recipe! 🙂 🙂 We enjoyed this so very much, and we will definitely be making this again! OK these were AWESOME. I was making them as an attempt to cure a craving for a cheeseburger wrap that a local diner does and they were, I swear, just as good. I used Mission Carb Balance Whole Wheat tortillas because that was all I had. I also actually used ground venison because I was out of beef, but you couldn’t tell the difference in taste. This is going in our regular meal rotation, hands down! I just want to thank you for this awesome and simple recipe! I’ve been on WW for a month and a half and I’ve been CRAVING a good burger. Trying to find the best way to make it point worthy and my goodness this was it! I tweaked it a little to fit my needs or tastes but it came out AWESOME! I had it with your oven fries and it totally satisfied that craving! Keep rocking the awesome recipes girl! This sounds delish! We don’t have the Flatouts here in Canada…what could I substitute? Oh my gosh Emily!!! My daughter and I just joined WW! We are on our second week, we both had a great first week too!! With that said, we made this recipe this evening and we both felt like we should have counted more points because this wrap was FANTASTIC!! A definite keeper for us! All we can say is thank you!!! Absolutely love this recipe My family gives it 6 thumbs up make it 12. Made these tonight. Couldn’t find the light queso cheese so I used the light swiss instead. Still turned out good. My wrap starting tearing but maybe I filled it up to much. Added pickles to mine as well. can I use wheat wraps rather than flatbreads for this do you think? This recipe came up in my WW meeting this week with high praise! Tried it for myself and it was BIG hit for me and my husband! Definitely squelched any burger craving we may have! We’re not huge fans of lettuce and tomato, so we sauteed an onion and bell pepper with a bit of cooking spray. VERY GOOD. Also, since there is only two of us, we used half the veggies and meat mixture tonight, then put the other half in containers to make us each a fresh wrap tomorrow night! Thank you for another delicious winner! I am not sure why, by when I put these in to my recipe builder it says they are now only 6 points?? Made these tonight. LOVED THEM! Took care of my burger craving immediately! Thanks for all your great recipes! They really help me stay on track with my cravings! Can you freeze these for later? Made these tonight and they were so good! I followed your recipe exactly and it came out so good that I almost felt like i was cheating on my diet, haha! Tried these tonight. They’re delicious! I added a diced up Clausen mini picked to mine. Yum!!! Do these freeze easily? I’m just one person but have been craving a cheeseburger for weeks! I can’t find the Laughing Cow queso chipotle anywhere!! Bummer! You can use another flavor of course or ask your grocery store to start carrying it!